Grr-Grr-Bike! is a fun way to learn about urban bike riding and support better biking in your community. Grr-Grr-Bike is a smartphone game where you guide a bike rider through the city, avoiding on-coming vehicles, car doors and other obstacles. You need to stop at red lights and for pedestrians crossing the street. You’re also being chased by a dog – that’s where the name comes from! The goal is to get as far along the street and pick-up as many coins as possible. See the game on YouTube! 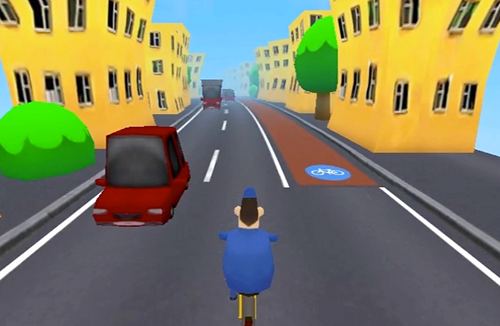 The game teaches players a little about urban bike riding, but is designed mainly to encourage players to get involved in local bike planning and advocacy. It does this by presenting a short information message in the results screen about local bike issues or safety tips (with links for more information). The game can provide targeted messages based on the player’s location, thus helping reach the right audience for local bike projects and advocacy groups. 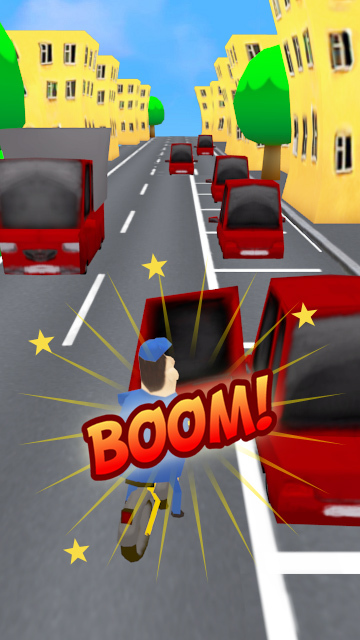 Grr-Grr-Bike mobile phone game screenshot. Grr-Grr-Bike’s results screen includes a link taking you to a page with information from your local bike group on local events, activities, projects that need support and information on getting involved. The goal is to broaden political support for bike projects and programs by exposing smartphone game players to local bike advocacy groups. Since many smartphone game players are young this would be a great opportunity for local advocacy groups to increase their membership and energy. Why is political support important? Political support is the critical missing element for many bike projects. Grr-Grr-Bike is designed to increase political support for bike projects by connecting players with local bike projects and advocacy groups via a link on the game results screen. Clicking the link takes you to a page with information from your local bike group on local events, projects to support and activities. Adding bike lanes, reducing automobile traffic and improving streets for bikes and pedestrians is a question of politics. We know how to make bicycling safer and more attractive. We know how to create cities where bicycling is the preferred mode of transport. Why aren’t we doing it? Quite simply, we still don’t have enough political power. Automobiles have taken over our cities even where a majority of people bike, walk or ride public transport. Grr-Grr-Bike is designed to increase our political power by introducing a new group of people to bicycle advocacy: people who support improved biking but need information about what they can do. Grr-Grr-Bike links players with their local bike groups via a link embedded in the game. The link takes people to a page with information developed by their local bike group on local events, activities, projects to support and membership. UPDATE: We’ve further developed this game in RingRide. We’ve finished the prototype. Now we’re seeking funds to finish the apps for Android and iOS, and to create the local bike advocacy information template. In the meantime we’re testing the prototype. We’ve already completed a usability and design study (you can read the results here). We’ll be making the game easier to use and increasing its educational value. For example, we want to discourage people from riding on the sidewalk – but that’s not clear in the prototype! We are also working on adding “in-app” purchases (e.g. faster bikes) to help fund game maintenance and to provide funds for local bike groups. On the long-term wish list is developing customised versions with street scenes from different cities and different obstacles, perhaps a Viennese coffeehouse waiter crossing the street with a Melange and glass of water delicately balanced on his tray? Please contact us if you’d like more information or you are interested in using the game to increase engagement for your bicycle project or planning process.